So, today is my first actual brew day log not done way after the brew day. I did a 2.7 gallon batch on the stove top. My ferm chamber is being used to lager an Oktoberfest, so the other way I can easily control fermentation temps is by using my Mr Beer keg, and putting it in a cooler. I then add frozen water bottles to the cooler as needed to ferment in the mid 60’s. I brewed Flood Waters, an American Amber ale. This would technically be Flood Waters 2.0, but the last time I brewed this beer was when I was still doing partial mashes back in the spring of 2013. I also changed the hop bill pretty drastically to give it some pop, and added Victory malt and a bit of Melanoiden malt to give a bit more malt complexity. This beer got its name from the fact that as the first batch was fermenting in my brother Kevin’s basement, we had terrible rain and flooding. My brother went downstairs to find several inches of standing water. My Ale Pale was on the floor, surrounded by flood water. Thankfully, nothing major was damaged, my beer included. On to the brew day. 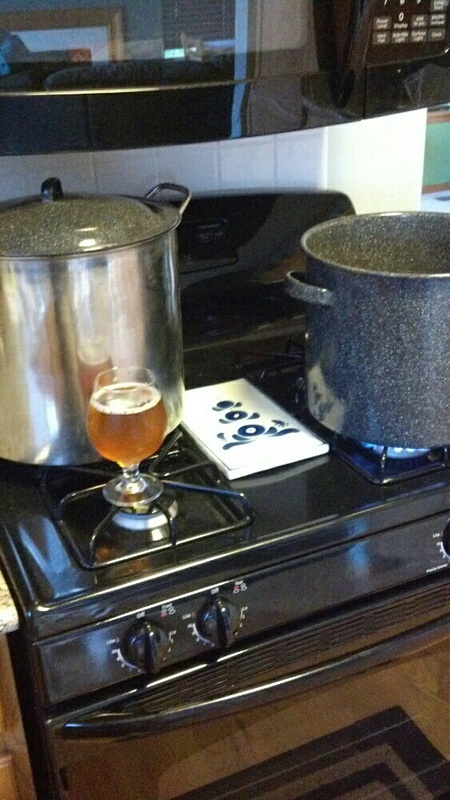 I cracked open a Ballast Point Sculpin IPA and heated up my pot/mash ton as pictured above. 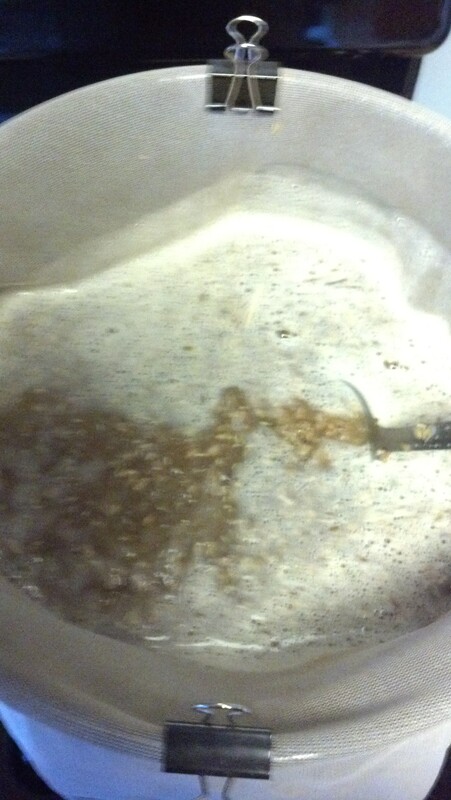 I mashed the beer at 154 degrees for 60 minutes to give it some body. Boiled for 60 minutes, with three hop additions, 60, 12, and flameout. I got my chiller going right at flameout, and chilled down to 75 degrees. I used Safale S-05 for this one. I usually re-hydrate when using dry yeast, but I got wrapped up with taking care of my and my in laws dogs, so I didn’t get around to it. Oh well, there’s more than enough yeast in those packs to ferment this small batch healthily. Filtered the hops and trub on the way into the little keg, stirred like crazy, took a hydrometer sample, pitched the yeast, then looked at the hydrometer sample I had taken. 1.052 OG, four points under my 1.056 goal. Damn. Well, thats why I keep DME on hand. 3oz DME in a couple cups of water put me close to where I needed to be at 1.055. I tossed that into the brew, then put the keg in the cooler. Bottling Day: I got 23 beers out of the little brown keg, not bad. I could have gotten a full case or more, but my hand slipped when I was racking and I stirred the yeast up when I was close to the bottom. Oh well. My FG came in a bit lower than anticipated unfortunately. I hit 1.009, so it brought my abv up to six. Sample at bottling was nice and clear, and tasted pretty damn good. The beer has been in the bottle for a couple weeks now which should be sufficient to start enjoying this brew! Appearance: Added a pic to the top of the post. It poured with a fingers worth of off white head. Though its hard to tell in the picture from condensation on the glass, the beer turned out very clear. Its a very nice amber color. Smell: Some slight pine, floral, and citrus aroma, and the aroma of bready malt. Taste: The beer has a nice slight bitterness to cut through the malt a bit. There are hints of citrus and pine. These hop flavors are well balanced with the malt flavors. The flavors from the malt are of toasted bread, a bit of caramel sweetness, and biscuit. I really like what the Victory malt added to this recipe. Mouthfeel: Medium carbonation and a fairly light body. The beer attenuated a bit more than I’d hoped, so its a bit dryer than I wanted this beer. Still, its very drinkable and nice. 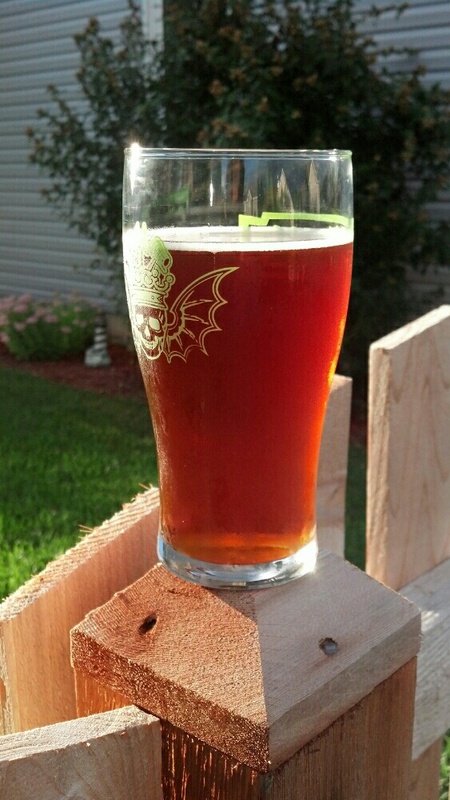 Overall: An improvement over the amber I brewed last year for sure. Its a slightly complex malt bill, but the parts all make a nice whole. I really like the hop profile on this beer. I do wish it had a bit more body, but this is still one of the best balanced beers I’ve made, pleasing to both malt and hop fans. Nothing in the recipe I’d change, just nailing the process down.